In view of last week’s article in “The Suburban” on the giant shopping center planned on a 93-acre farm in King of Prussia, it is enlightening to study the picture at right, originally printed in the Philadelphia “Inquirer” of June 23, 1954. This picture has been made available to your columnist by the “Inquirer” through the courtesy or Paul McC. Warner, editorial page director. Mr. Warner lived for many years on Midland avenue before moving to Daylesford, where Mrs. Warner and he have remodeled the famous old “Blue Bell” tavern into a charming home. Last week’s “Suburban” described the retail store area of this tremendous shopping center as being “visible from four main highways fronting on Route 23 near 202, between interchanges serving the Schuylkill Expressway and the Pennsylvania Turnpike.” This explanation becomes very clear when the sketch to the right of the picture, of the old King of Prussia Inn, is studied. A landmark since Colonial days, the inn was saved from destruction at the request of historical groups when the State Highway Department widened Route 202. 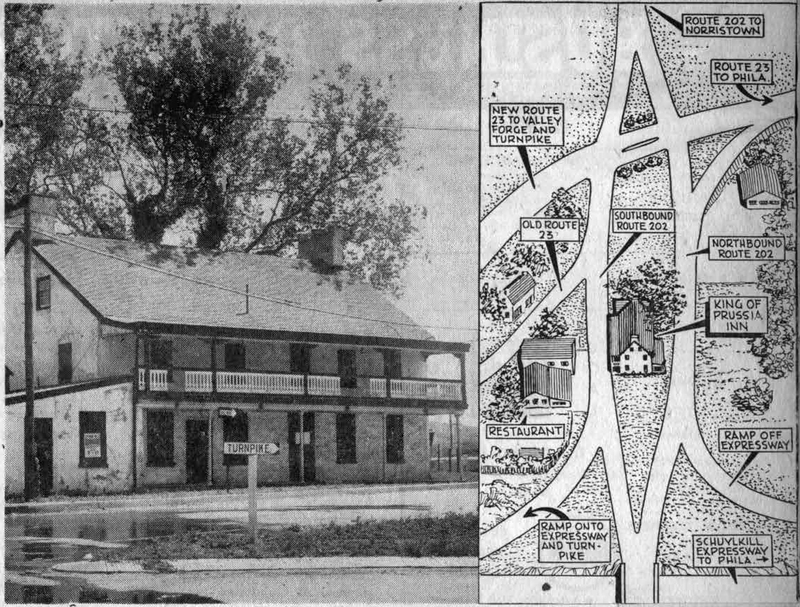 It was feared that the structure would have to be moved or demolished for the widening of the highway, but after its purchase by the Department, plans were changed to split the newly located Route 202 so that the inn could remain on its original site. 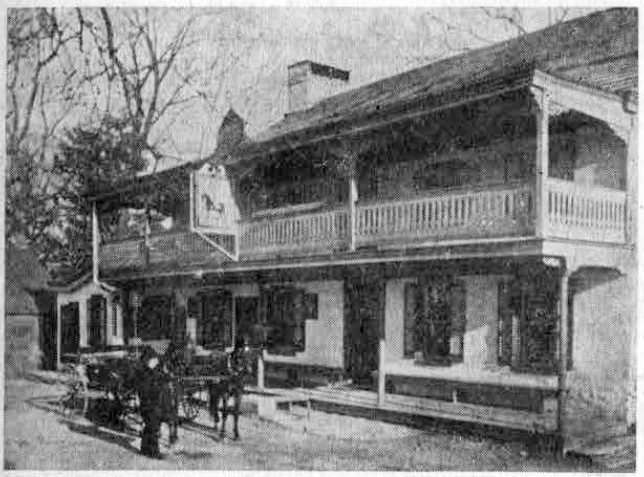 Various plans to restore the historic inn have been considered, but, as the tentative figures for this have been almost prohibitive, these plans have not materialized. The recently formed citizen’s group is asking the highway department for permission to use the building as a community center and a library site. There is no library in Upper Merion township at present. which stood a few rods away. Now safely boarded up against the elements, the historic old inn, so sturdily built some 250 years ago, waits the decision of the Highway Department and of Upper Merion township as to its ultimate fate. Those to whom all that pertains to the Valley Forge neighborhood is sacred can only hope that this building which, according to historians, often sheltered George Washington and his officers, may be preserved for posterity.